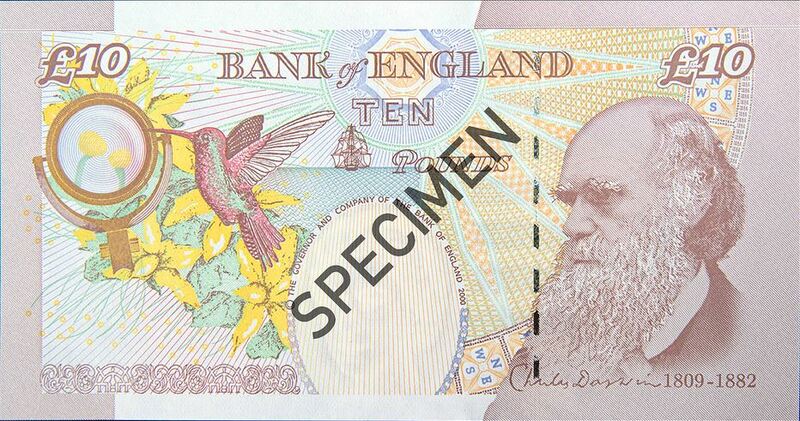 The current 10 pound note features Charles Darwin, the Victorian naturalist who developed the theory of evolution. Also pictured is an illustration of Darwin 's own magnifying lens and the flora and fauna that he may have come across on his travels. Banknotes are printed on special paper that gives them their unique feel. By running your finger across the front of the 10 pounds note you can feel raised print in areas such as the words ‘Bank of England’. There is a metallic thread embedded in every banknote. This appears as silver dashes on the back of the 10 pound sterling note. If you hold the note up to the light the metallic thread will appear as a continuous dark line. 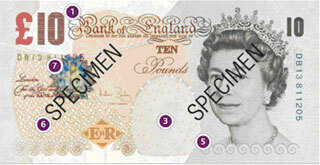 The printed lines and colours on the 10 pound note are sharp, clear and free from smudges or blurred edges. 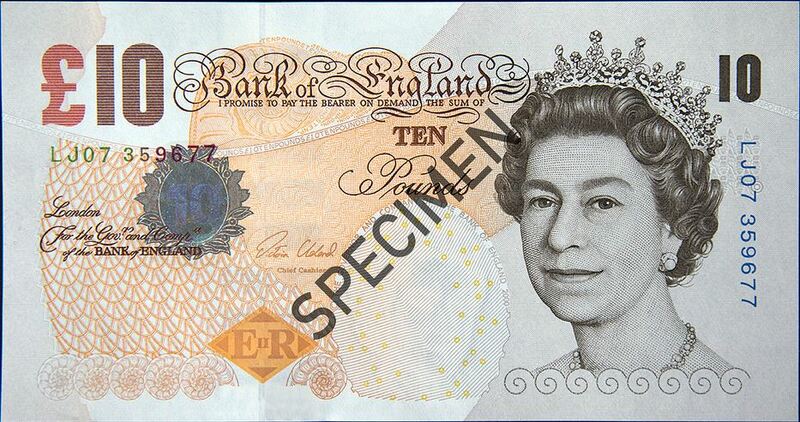 Using a magnifying glass, look closely at the lettering beneath the Queen’s portrait on the 10GBP- you will see the value of the note written in small letters and numbers. 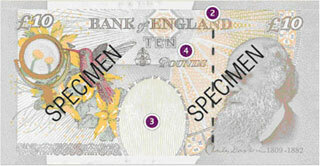 If you look at the front of the 10 pounds sterling note under a good quality ultra-violet light, the number 5 appears in bright red and green whilst the background remains dull in contrast. There is a hologram on the foil patch on the front of the 10 GBP note. If you tilt the note, the image will change between a brightly coloured picture of Britannia and the number 10.